Gina Brescianini was a soloist with The Australian Ballet for 10 years and has been fortunate enough to perform all over Australia and the world, in traditional and contemporary ballets. Gina started practicing Kundalini yoga as taught by Yogi Bhajan in 2001, perfect for supporting her busy ballet life. She was practicing, learning and studying at every spare moment, completing her teacher training in New Mexico in 2010. 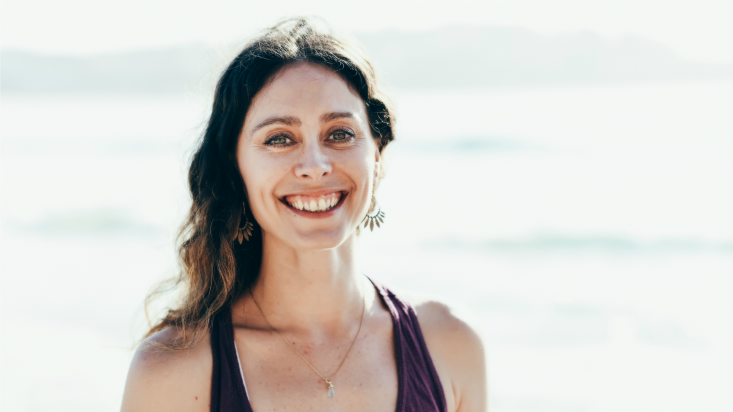 She is a pilates instructor and has had her own business, Radiant Awakening Kundalini and Pilates Center in Neutral Bay and Mosman, Sydney from 2010-2013. During that time Gina found Power Living Yoga and completely fell in love with the practice and the community. The Power Living style was the perfect practice to bridge the gap she had been looking for. Gina has studied with Simon Park in Vinyasa flow yoga, as taught by Shiva Rae and with Sarah Powers (Insight yoga) in styles Yin, Yang and meditation. She teaches ballet at Sydney Dance Company and The McDonald College of Performing Arts and continues to conduct workshops and summer schools throughout Australia. Gina is so full of passion and joy to share her love of yoga and meditation with the community at Power Living and beyond. The wheel! I love the liberating feeling and opening it gives to your heart centre! Ray of light, bubble of joy. Share with us a life turning point and favourite lesson learnt. A huge turning point for me was when I did my first yoga teacher training in New Mexico in an ashram in the middle of the desert. It showed me the power of a community that was rich in positivity.